Today we toured in the Northern Snake River Range over Edelweiss and skied the Shamrock into the Columbia Bowl drainage and made a few laps on the easterly aspects of the Columbia Bowls. The low angle slopes provided good snow conditions and safe backcountry terrain. The good news is that the skiing is great where it is not wind affected. The bad news is that the spacial distribution of this problem is fairly widespread. 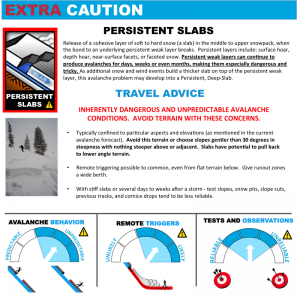 As reported by the Bridger Teton Avalanche Center you can expect it on all aspects of the mid and upper elevations and on the northerlies in the lowest elevations. 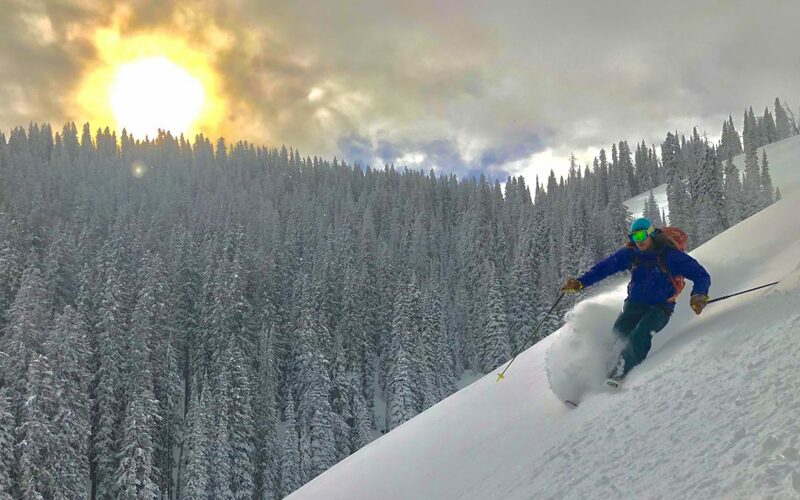 In other words…ski the trees, ridge lines and lower angle slopes. We found the best snow areas protected from the wind and in the mid-elevations. Below you will find a mark up of our focused test site. It represents a classic strong over weak structure. In this area the slab is not very stiff. The slab stiffens up from top to bottom progressively from Fist to 4 Finger hardness. Generally we expect reactivity from a slab that skips a step of hardness between the weak layer and itself. 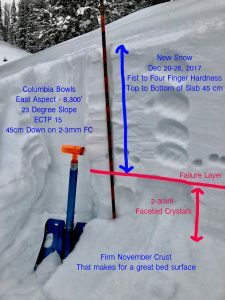 With the slab being 4 finger and the facets Fist is is logical to forecast that as the slab settles and stiffens or as new load is applied the release of avalanches on this layer will increase.